One of the 16 workers at a New Jersey Vehicle Services Department has come forward to talk about being the area’s newest millionaires. Sue Nickel, an employee at the Ocean County Vehicle Services Department in Toms River, New Jersey, told NBC-10 she is completely stunned after learning she along with her 15 co-workers will each take home nearly $4 million after taxes. “I am numb I can’t even imagine what’s going to happen in the next few months. My family is here with me I can’t even tell you,” Nickel told NBC10. Nickel, surrounded by family and friends at her home Friday night, said she found out yesterday morning that she along with her co-workers hit the winning number drawn Wednesday night. Nickel and the group all chipped in $6 each in an office pool to win the big prize. She says while she is excited about winning the multi-million dollar jackpot she doesn’t plan to retire anytime soon. “Oh yeah, I went to my job today. I love my job. I have to work another year and a half and I want my hubby to retire because he’s worked a long time and we haven’t decided on anything other than that,” said Nickel. Nickel says she is a Superstorm Sandy survivor. Her house was flooded and most of her belonging destroyed. “We had 7 feet of water but we are very lucky. Some of the money will be used to go to help with that,” said Nickel. Nickels’ other co-workers, who have not come forward yet, range in age from their late 20’s to nearing retirement. Maintenance Department Director Jim Pine and Freeholder Jack Kelly said the employees have the ticket sold at the ACME supermarket in Little Egg Harbor. The other winners are expected to come forward after the weekend, according to Pine. A second ticket was sold in a Super Stop & Shop store in South Brunswick in central New Jersey. A Minnesota has man claimed his third of Wednesday’s jackpot. 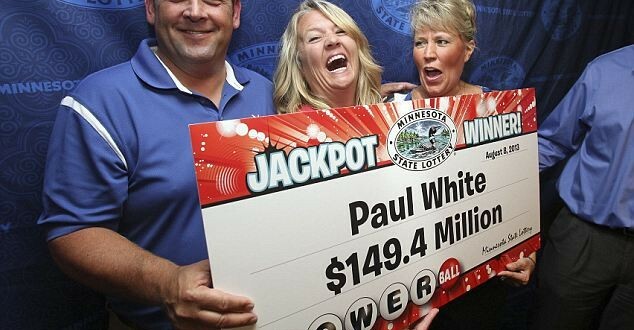 White said his family often gave him a hard time for frequently playing the lottery, and he had a tough time convincing many of them that he had finally won. “The only person who didn’t feel I was BSing them was my mother,” a beaming White said at a news conference where he was joined by his girlfriend, brother and two colleagues. White said he’ll take a lump sum, which will amount to $58.3 million after taxes. Despite the minuscule odds of a jackpot win, White said he often daydreamed about how he’d spend his winnings if he won. “I’ve totally been waiting for this day my entire life,” he said, lamenting that he has to wait two weeks for his money. “Start the clock right now,” he said, eliciting laughs. White said his girlfriend called him Thursday morning to say a winning ticket had been sold in Minnesota, and he quickly checked the 10 he had bought the night before. Mega-jackpot winners often wait days or weeks before claiming their prizes, giving them time to prepare and make legal arrangements. White said he had an attorney and financial adviser in mind, and wasn’t afraid of the publicity. White said he is divorced and has a 16-year-old son and 14-year-old daughter. He said his days working for a Minneapolis electrical contractor “are over,” although he said he planned to help his boss, Ron Bowen, finish some projects before quitting. The winning numbers drawn Wednesday night were 5, 25, 30, 58, 59 and Powerball 32. Each winning ticket was worth $86 million before taxes, or $58.3 million after taxes, if taken in a lump sum. They are worth $149.4 million over 30 years if the winners choose the annuity option.